Despite traveling extensively, I’m still impressed when I discover big things in small places. Cartersville, Georgia, a city of 20,000 residents about 40 minutes north of Atlanta, offers major draws. It’s the smallest town in the U.S. with two Smithsonian Affiliate Museums: one an art museum and the other a Science facility. The Booth Western Art Museum houses the largest permanent exhibition space for Western art in the entire country- yes, the entire United States. And, what a fabulous place it is. Approach the modern 120,000-square-foot limestone and glass building and discover an outdoor sculpture garden. Larger than life statues of what kids call ‘cowboys and Indians’ populate the lawn. 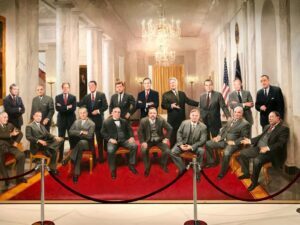 Inside displays of contemporary Western artwork, Civil War art, more than 200 Native American artifacts and presidential portraits and letters abound. Cowboy statue in the sculpture garden outside the Booth Museum, Catersville, GA.. The American West Gallery spans 175 years, with poignant creations by famed artists such as Charles M. Russell, Frederic Remington, and George Caitlin as highlights. Artifacts include beaded clothing, saddle and leather art and a cowboy collection. The Civil War Gallery displays evocative artwork that chronologically depicts battles and events from the tragic divide. The Modern West Gallery focuses on Western art from the past 50 years. Contemporary pieces by Western trendsetters incorporate bronze, fiberglass, and even paper, and show the progression of stylistic changes. A pop art styled portrait of Sitting Bull by Andy Warhol may be far removed from the artist’s Pittsburgh roots, but captivates. The Millar Presidential Gallery took me by surprise – itself reason enough to visit. The gallery showcases a signed, page-long letter by each of the forty-four previous American Presidents. Meandering through the personal documents in the dimly lit space gives a sense of intimacy with the past leaders. Some visitors simply enjoy comparing the handwriting and signatures and viewing the photos. Adults love Sagebrush Ranch as much as the children for whom it was built. 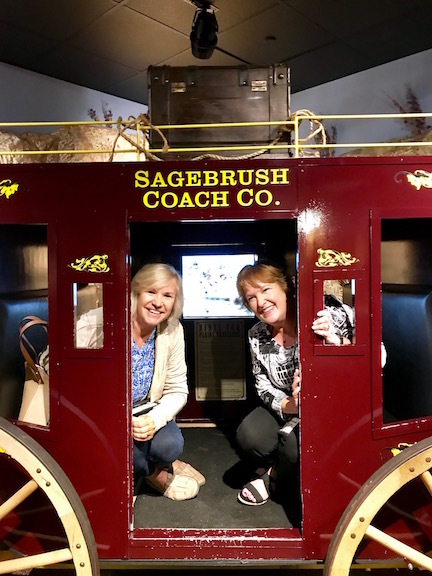 My inner child couldn’t resist the hands-on, interactive exhibits and I giggled sitting in a stagecoach bouncing along as if being pulled by horses. Children are encouraged to recreate Native American beadwork, make a Western landscape, invent designs branding, dress as settlers and mount a replica horse for photo ops. Having fun in Sagebrush Ranch. Stagecoach in the Booth Western Art Museum. 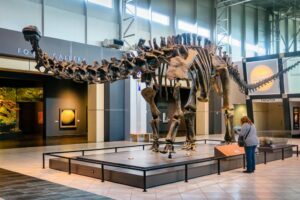 While in Cartersville, take another day to tour the equally immense and fascinating Tellus Science Museum. Who can resist a dinosaur fossil with an oversized personality? This guy jumps out from a lobby and pulls you into an area brimming with the bones from giant mammals, reptiles, and dinosaurs, like the Tyrannosaurus Rex, saber-tooth cat, and the Megalodon shark. One of the most appealing areas for children is the sand pit where kids, aka young paleontologists, can free fossils in various shapes and sizes. 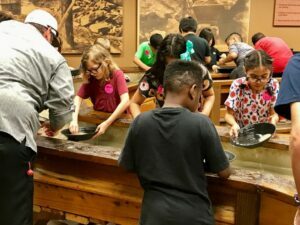 Next, they grab a pan at the Gem Panning exhibit and begin searching for hidden stones and crystals. Children may keep their discoveries as souvenirs. Mineral mining contributes to the economy in this region and the Mineral Gallery in the Tellus is a real gem. The gleaming displays of gigantic geodes and polished gemstones even astonish hobbyists. Don’t leave before taking a visual journey through our solar system in the state-of-the-art Planetarium. If Native American history appeals, drive to the Etowah Indian Mounds State Historic Site. The flat-topped mounds date back to 900-1550 A.D. Climb to the top and tour the small museum to learn about this historic settlement. The Cartersville area also includes Old Car City USA, the world’s largest known classic car junkyard covering 40 acres with miles of walking trails. Many car buffs and photographers find the forest of 4,000 forgotten cars irresistible. I honestly did not; a half hour visit was enough for me. If you’re looking for big-city attractions in a small town atmosphere, you’ll find them in Cartersville. For more information: VisitCartersvilleGA.org. A similar article to the above ran in the Florida Newsline publications: Consider Cartersville.